This is probably my favorite necklace that I own. It is by Les Néréides, a jewelry designer that caught my eye in Printemps. 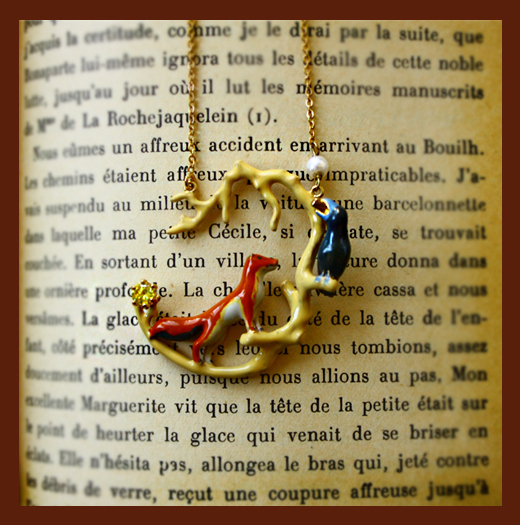 A fox and a crow with a golden piece of cheese in his beak. In ninth grade, the very first French poem I had to memorize and recite was Jean de la Fontaine’s Le Corbeau et le Renard (The Crow and the Fox). « Hé ! bonjour, Monsieur du Corbeau. The crow has a nice piece of cheese, and the fox flatters him into singing, tricking the crow into dropping the cheese. I think it’s a good lesson to wear around your neck.